1. The mat holds the surface of your artwork away from your glazing (usually glass or plexi-glass). If artwork touches the glazing surface, it will eventually stick due to humidity, and the work will be ruined. 2. 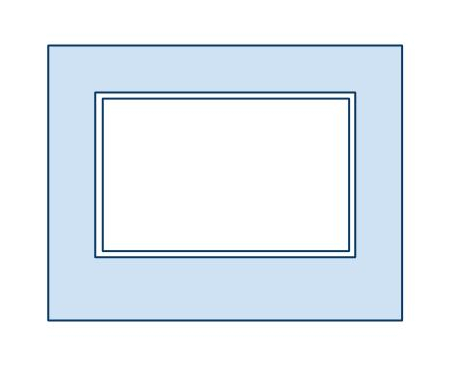 The mat creates a clean visual border between your frame and your artwork. WHAT KINDS OF MAT BOARDS ARE THERE? Museum mat board is made of 100% cotton. It naturally contains no acid content and is therefore inherently acid-free. Museum cotton mat boards are generally the most expensive option. Acid Free or “conservation” mat board is usually made from wood (paper) pulp. Most of the lignen has been removed from the pulp, and the material has been buffered with calcium to further stave off the effects of acid. Although this kind of mat board is called “acid-free”, it is not 100% archival as it is not 100% acid free. Regular mat board is made of regular paper pulp and has only some or none of the lignen removed. It is not considered archival and will yellow with time, and likely leech acid onto whatever it is touching. It is the least expensive option. WHAT COLOUR SHOULD MY MAT BOARD BE? Mat boards are manufactured in a staggering array of colours. The colour of your mat is entirely up to you. Something to consider: museums and contemporary galleries usually use a neutral white or off-white mat. This method of matting does not “take away” from the artwork—the work remains the central focus. If you choose a coloured mat, it could accentuate or compliment your artwork. But, it will essentially become part of your artwork. It is up to you whether you want the mat to add to your work in this way.